I completed my Ph.D in Biochemistry in 2016 at the University of Cambridge, under the guidance of Professor Christopher Howe and Dr Andrew Spicer of Algenuity. Together with collaborators, the Howe lab has pioneered the development of biological solar cells, which are able to produce current as a result of photosynthetic activity in cyanobacteria. I then joined Professor Patricia Harvey’s laboratory to work on the D-factory project, which aims to set up a sustainable CO2 algal biorefinary utilizing the algae Dunaliella. While there I also contributed to a European Commission report ‘food from the oceans’ as part of a high level group of scientific advisors. I have now returned to Chris Howe’s lab as part of the OpenPlant Project. The goal of this project is to create an overexpression system for transgenes that is sensitive to changed in electropotential. It has been estimated that plants can produce over 1 million specialized metabolites, but we know less than 0.1 % of their biosynthetic pathways. Creative methods are eminently needed to look under the iceberg of largely untapped biosynthetic pathways. As a post-doc from Anne Osbourn group at John Innes Centre, I am employing multidisciplinary approaches across bioinformatics, genetics, and chemistry, to comprehensively understand how and why plants produce this hallmark of specialized metabolites. I am currently focusing on plants from the Brassicaceae family and systematically studying the function, evolution and biosynthesis of triterpenes from this family. I am in particular interested in pathways encoded by gene clusters. It holds great potential to mine more and novel biosynthetic pathways efficiently. However, how and why plants have evolved BGCs is still a mystery. We are aiming to gain the first understanding of their assembly, patterns of evolution and common features in a systematic fashion. This knowledge can then be used as a template guiding the research of BGCs in other types of compounds and plant families. I am a molecular biologist, with a background in plant transcription factors, flavonoid biosynthesis, natural colours and metabolic engineering. In Cathie Martin’s lab at the John Innes Centre, we have recently developed novel suspension cultures from engineered tobacco plants, to obtain stable sources of natural colourants. These cultures can produce exceptionally high levels of red to purple anthocyanin pigments, and allow a scalable constitutive year-around production under controlled conditions. Intense blue colours are rare in nature and difficult to reproduce in pigment formulations, which is the main reason why almost all blue food colourants are synthetic dyes. Our project aims to investigate the structural properties of anthocyanin preparations that confer strong and stable blue colours and to select for anthocyanins with improved stability as reliable natural colourants. Our goal is to extend our plant cell culture approach to develop the first production platform for blue anthocyanin colourants, to replace synthetic food dyes. I obtained my PhD in Cell Biology from the University of Edinburgh, mentored by Prof. Jean D Beggs. During this time, I was interested in the spliceosome cycle, in the connection between splicing and transcription, and also in how proofreading factors help to prevent error in splicing. I spent a significant amount of time using the auxin-inducible degron to conditionally deplete essential proteins, and finding ways to improve this depletion system to get a faster and more tightly-controlled response. My desire to embark on plant synthetic biology, while maintaining an interested in splicing and conditional expression systems, lead me to join the Plant Metabolism Group of Prof. Alison Smith in October 2017, to develop riboswitches as molecular tools to control transgene expression in algae, higher plants and other eukaryotes. The ultimate aim of this project is to develop novel inducible systems for metabolic engineering applications or as in vivo sensors of metabolites. Eftychis did his PhD at Oxford University focusing on the evolution of developmental mechanisms in land plants. During his doctoral research he developed a strong interest and fascination for bryophytes. He then moved to the University of Tokyo to work with the least studied group of bryophytes, hornworts. After a short detour in Hong Kong he is now back to the UK working on the development of new synthetic biology tools in Marchantia. Francisco J. Navarro's work focuses on the function of small RNA (sRNA) molecules and their use as regulatory elements in synthetic gene circuits. sRNA molecules most likely evolved as a defense mechanism against viruses and retro-transposons, and were co-opted for fine-tuning of gene expression. Their small size and predictable targeting rules make them perfect tools for regulating gene expression in synthetic gene circuits. This project is carried out in the green alga Chlamydomonas reinhardtii, which is amenable to genetic manipulation and a model organism for key plant processes, such as photosynthesis. With an sRNA pathway that resembles that of higher plants, Chlamydomonas allows the testing of proof-of-principle small RNA-based genetic devices before extrapolating to other plant species. Francisco completed his PhD in the laboratory of Prof. Jose Manuel Siverio (University of La Laguna, Spain), studying nitrate assimilation in Hansenula polymorpha, a methylotrophic yeast with important biotechnological applications. This was followed by a postdoc in the laboratory of Sir Paul Nurse, first at The Rockefeller University, USA, and then at the London Research Institute, on cell size control and regulation of gene expression by RNA-binding proteins. Through systematic screening of a gene deletion collection of the fission yeast Schizosaccharomyces pombe, he identified a set of novel genes involved in the coordination between cell growth and cell cycle progression. In 2015, he joined the laboratory of Sir David Baulcombe in the Department of Plant Sciences, University of Cambridge. Francisco’s research interests concern questions regarding global regulation of gene expression and limits of cell growth. These questions are relevant to synthetic biology because synthetic gene circuits are embedded into the cell’s own gene network, and so their activities are not insulated from global cell regulation. He believes that microorganisms, like Chlamydomonas, will continue to be useful research models to uncover new exciting biology, and contribute to the advancement of synthetic biology. The fast growth of unicellular algae, in addition to a range of recently developed tools and resources, are making these organisms an interesting chassis for synthetic biology, with industrial applications in the biopharming sector. I am interested in the interface between applied plant breeding and plant metabolism. In my master’s thesis we used classical breeding of passionfruit with the goal of releasing new varieties, now used by farmers. In my PhD thesis we studied carotenoid metabolism in melons and established a molecular marker now used routinely by melon breeders. More importantly, we suggested a novel non-transgenic path toward pro-vitamin A carotenoid biofortification of food crops. The objective of the current OpenPlant project is to develop pre-breeding lines of beetroot for the production of L-DOPA. L-DOPA is used to treat Parkinson’s symptoms; however, the current costs of chemical synthesis make it unavailable for deprived populations worldwide. In addition, there is a growing demand for ‘natural’ or plant sourced pharmaceutical substances in the first world. 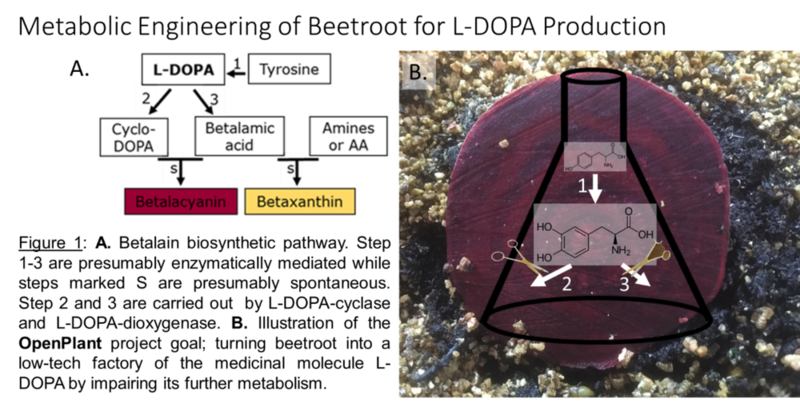 L- DOPA, a product of tyrosine hydroxylation, is an intermediate metabolite in biosynthesis of violet and yellow betalain pigments, in Beta vulgaris (table beet). L-DOPA natural steady state levels are very low, usually undetectable. We intend to block the turnover of L-Dopa in beetroot to allow its accumulation to levels that could enable low-tech accessible production in a plant system. Current data indicate two betalain metabolic genes that, if repressed, may boost L-Dopa accumulation. Therefore, we aim to inhibit the activity of L-DOPA-dioxygenase, and L-DOPA-cyclase in beetroot. Currently, as proof of concept, we silence both genes in hairy roots system. We adopted three complementary strategies to meet the overarching objective of L-DOPA production in beet: a) Classical genetics; b) targeted genetic mutagenesis; and c) random mutagenesis. Yellow beet, mutated in L-DOPA-cyclase exists and can be crossed with “blotchy” red beet, which probably has lower L-DOPA-dioxygenase activity. Impairing L-DOPA-dioxygenase activity in yellow beet is carried out by both the targeted mutagenesis technology CRISPR/Cas9 and the random, yet more assured, EMS mutagenesis approach. As the Research Technician for the Haseloff group, I work closely with Susana Sauret-Gueto, Research Lab Manager, to ensure the smooth running of the lab. I am responsible for Marchantia polymorpha tissue culture and am working on the standardisation of existing protocols for the propagation, transformation and short and long term storage solutions, including cryopreservation. This work will enable and facilitate the high-throughput screenings of Marchantia lines, such as the Enhancer Trap lines; a project on which several lab members collaborate. A summer student joined us for 8 weeks to work on this project and I helped with her supervision and provided laboratory training. I am applying the genome editing tools to generate novel, commercially or nutritionally valuable glucans in model crop species. The primary objective of my OpenPlant project is to generate potatoes that contain digestion-resistant starches with two major nutritional benefits: reduced calorie intake from consumption of chips, crisps and other potato-based foods and increased supply of complex carbohydrates to the microbiota of the lower gut that reduces risk of several diseases including colorectal cancer and type II diabetes. More specifically, the project involves knocking out the gene(s) of starch branching enzymes I and/or II using crispr-CAS9 method thereby increasing the ratio of amylose to amylopectin (linear to branched starch chains) in tubers without significantly compromising the starch yield. The engineered starch will be less accessible to starch degrading enzymes, thus more resistant to digestion. Plants can be used as a production platform for high-value products such as vaccines, enzymes and metabolites, thereby providing a potentially fast and cost-effective alternative to other cell culture techniques. Developed within the Lomonossoff group, HyperTrans (HT) is a technology for rapid, high-level transient expression of proteins in plants. One key application of HT in the Lomonossoff group has been the production of virus-like particles for use as vaccines, scaffolds for nanotechnology and in fundamental research of virus assembly. Virus-like particles (VLPs) consist of viral structural proteins which assemble into a particle resembling the virus but devoid of the viral genome and therefore unable to replicate. Different VLPs consisting of multiple copies of one, two or four different structural proteins have been successfully produced using the HT system and shown to be morphologically and immunologically representative of the virus. In recent years, a number of emerging diseases have been caused by enveloped viruses such as Zika virus and Chikungunya virus. Such complex virus structures can make the development of efficient vaccines and diagnostic reagents difficult and costly. In my OpenPlant project, we are working on developing strategies for the production of enveloped VLPs in plants. I am also working on modifying a large non-enveloped VLP to allow accommodation of cargo proteins on the inside of the particle. In addition to my research project, I was involved in the planning stages for the new John Innes Centre spin-out, Leaf Systems International Ltd, which opened on the Norwich Research Park in January 2017 and will enable translation of research to indsutry through scale-up of plant-based production of proteins and metabolites. I have also participated in various outreach activities, such as a TV interview for regional news, the Great British Bioscience Festival, JIC’s Speed Science event as well as a work experience day for school children, amongst others.